An announcement that was sent by Acme gallery this weekend. After 22 years in business, Los Angeles’s Acme gallery will close, according to online posts by sources including two artists represented by the gallery. Opened in 1994 on Santa Monica, Acme was founded by Robert Gunderman and Randy Sommer, both of whom had previously worked together at the alternative space Food House. It later moved to Wilshire Boulevard, and in 2016, the gallery relocated to the city’s Elysian Valley neighborhood. 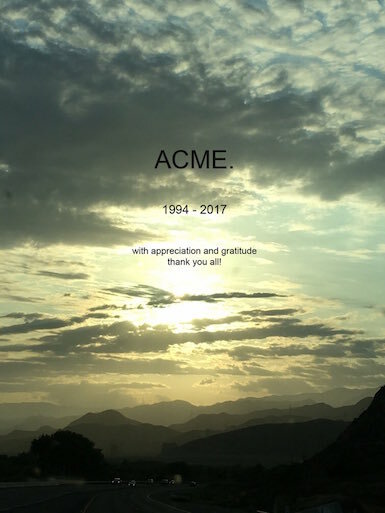 On its website, Acme’s roster currently includes Kai Althoff, Kristin Baker, Miles Coolidge, Daniel Cummings, Tomory Dodge, Tony Feher, Carlee Fernandez, Natalie Frank, Iva Gueroguieva, Kevin Hanley, Michael Henry, Hayden, Matt Merkel Hess, Bill Jensen, Kurt Kauper, Aaron Morse, Michael Norton, Dario Robleto, Julian Rogers, Brian Nudo Rosch, Lisa Sanditz, Jennifer Steinkamp, Neal Tait, and Amir Zaki. Acme currently has two shows scheduled through June 10. After those exhibitions, Acme will officially shutter, the gallery confirmed by email today.